Here is an idea I got from my friend Tanita and Keith. 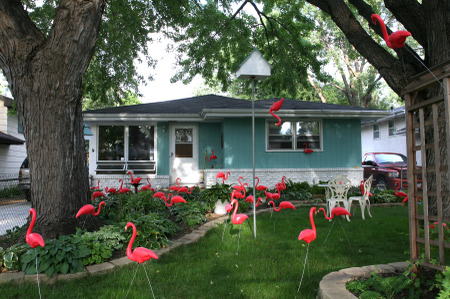 You buy some plastic pink flamingos, then you go put them a friend’s yard (preferably someone with a sense of humor and a connection to YL). Then you leave a sign on one of them that says, “You’ve been flocked by XYZ YL!”. Then the letter explains that it is a fundraiser for camp and that for $25 (or whatever you choose), they can have them removed. For $10 more they can “flock” whoever they choose. And for $10 more they can purchase “Flocking Insurance” so they will not be flocked again. Of course the letter also says that you will gladly remove them for free as well. My friends who have done this say almost everyone makes a contribution and thinks it is great. It is great contact work with kids and allows them to be a part of the fundraising. You will also get a chance to introduce new people to YL. This is my kids’ favorite fundraiser!! We make it a big deal by dressing in all black and “flamingo-ing” (that’s what we call it) at 1am or later! (Often followed by a Denny’s run!) GREAT fundraiser!! 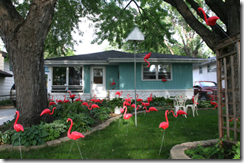 Where do you get the flamingos? Look here… http://www.kitestailstoys.com/product.php?productid=22082&cat=0&page=1 I’ve heard there are cheaper places too.